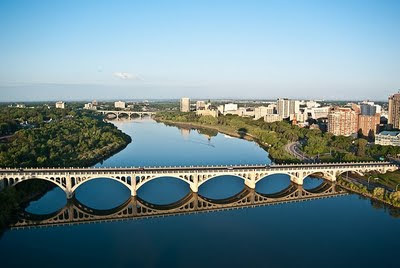 Lazily curving its way through Saskatoon, the South Saskatchewan River is a central feature of our city. 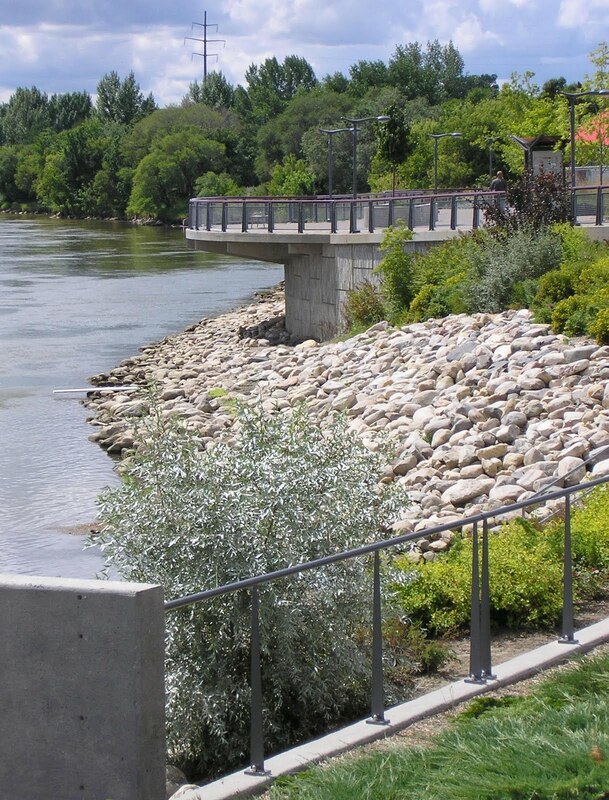 The riverbanks have sustained local residents throughout the centuries – from First Nations people gathering to pick Saskatoon berries to current-day cyclists, kayakers, and jazz musicians. Early settlers recognized the importance of green spaces and limited private development along the river. This tradition has been maintained. In 1979 when a local developer wanted to build on riverfront property in River Heights, local residents united to defeat the proposal, and the provincial government created the Meewasin Valley Authority. The Meewasin Valley Authority (MVA) is responsible for protecting and developing the South Saskatchewan River Valley and for educating the public about the valley’s natural, cultural, and heritage resources. Their jurisdiction stretches from Pike Lake and Beaver Creek in the south to Clark’s Crossing in the north, encompassing conservation areas, parks, museums, interpretive centres, the university lands, canoe launches, community links, and over 60 kilometres of Meewasin Trail. The Meewasin Valley Authority is responsible for designing and developing infrastructure and facilities (trails, benches, playgrounds), conserving and promoting the natural and heritage resources of the area (conservation activities, interpretive signage, educational programs), and for reviewing development proposals within their jurisdiction (River Landing, Preston Crossing). In 1978, the City and the Province sponsored a 100 Year Concept Plan for the river valley, prepared by Raymond Moriyama of Moriyama and Teshima Planners of Toronto, Ontario. The plan continues to direct the work of the Meewasin Valley Authority on both a practical and a visionary basis. As the MVA reviews proposals for development within the conservation area, they consider not only the built and natural environment but also how people will use the space, the economics, and the social climate. A large number of authorities reviewed the plans for the South Bridge and its potential impact on the land, the fish and the water to ensure that it complied with all the relevant regulations. In addition, the MVA looked at the river valley and its inhabitants. They took into consideration how the bridge would hook up with the trail system and the pedestrian experience (parks, access to the bridge). The design of River Landing demonstrates the blend of poetics and pragmatics. The structure is solidly in place, but there are also mosaic fish designed by local school children, a bridge curving around a fish spawning area, and a water park providing an interpretive map of the Saskatchewan River basin. 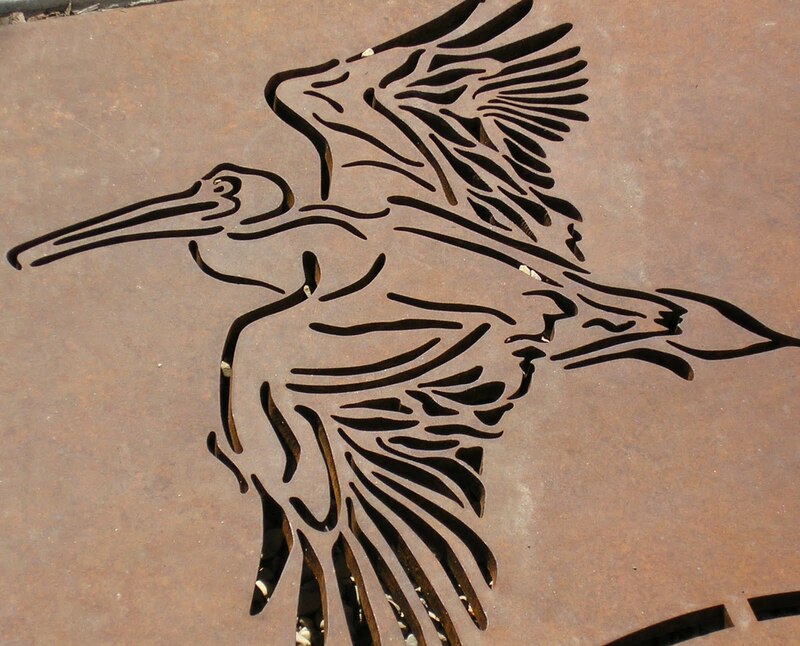 Even the tree grates (many designed by local students) serve as public art with designs that include local produce at the Farmers’ Market, pelicans and ducks along the lower paths at River Landing, and Aboriginal designs on the upper trails. A significant portion of the MVA’s resources over the past few years have been dedicated to developing River Landing. Working closely with the City, the MVA occupied the lead role during the first phase of the project, which included design work and hiring contractors. They are now serving as project manager during the second phase. Moriyama’s plan foresaw River Landing as the point at which the downtown core connects with the river. Serving as a transition from the busy city streets, it is more hard-edged and less natural than other parts of the valley. 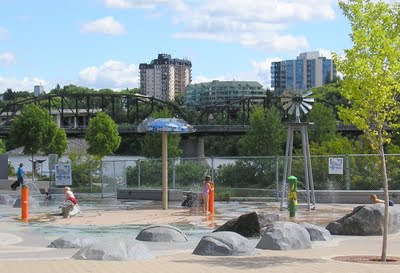 Although still under construction, River Landing is already a popular place for families with children, cyclists, and pedestrians and is home to a number of events, from river festivals to craft fairs. Meewasin Valley Authority nurtures and provides indirect support for several non-profit associations, including Partners for the Saskatchewan River Basin, Saskatoon Heritage Society, and RoadMap Saskatoon. RoadMap Saskatoon’s goal is to increase awareness and to educate individuals, businesses and institutions on the importance of sustainability. A key facet of their work is to facilitate networking between different groups, such as their Sustainability Champions, community leaders who share their experiences of making their organizations more environmentally friendly. RoadMap Saskatoon approaches sustainability from a very broad perspective that encompasses community, environment, and economy. The organization has been restrained by limited funding but believes it can play a significant role by serving as a neutral arbiter, viewing individual issues from a more holistic standpoint. Pamela Larson is RoadMap’s Planning Officer and has a degree in Urban Planning. She is looking forward to expanding the Sustainability Champions program as well as undertaking other new projects. The organization’s most successful project to date is the Bicycle Valet, which provides a secure area where people can leave their bicycles while attending local festivals. They stored over 1500 bicycles during the Saskatchewan Jazz Festival and just under 1200 bicycles during Taste of Saskatchewan (over 300 in a single day). Meewasin Valley Authority carries out a tremendous variety of activities on relatively limited funding. And they don’t waste money tooting their own horn. Do check out their calendar of events, which includes activities for children and heritage programming at the Marr Residence. Visit their interpretive centres at Beaver Creek Conservation Area and their downtown location. Go for a canoe ride in the summer or skating in the winter. Sign up for Explorer, Meewasin’s bi-monthly newsletter by sending an email to meewasin@meewasin.com. But, above all else, get outside and enjoy the trails and the riverbank. The river valley is Saskatoon’s most valuable treasure, and the Meewasin Valley Authority is fulfilling an important function by safeguarding it for future generations.